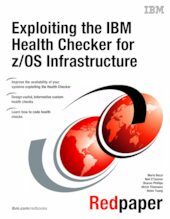 The IBM® Health Checker for z/OS® (also identified in this book as IBM Health Checker) is a key component of the z/OS operating system, whose objective is to identify potential problems before they impact the system’s availability. To do this it continuously checks many current, active z/OS and sysplex settings and compares them with those suggested by IBM or defined by you. - A framework that provides check management and execution services. It supports check development by IBM, independent software vendors (ISVs), and users. - Individual checks that look for specific z/OS settings and definitions, checking for potential problems. Customers can use the IBM Health Checker for z/OS infrastructure to run their own checks, extending the reach of IBM Health Checker for z/OS to environment-specific settings. This IBM Redpaper™ publication introduces the IBM Health Checker and describes how to activate and use it. It teaches you how to exploit the IBM Health Checker infrastructure to run custom checks and how to identify good candidates for writing your own checks. This publication also provides a number of sample checks to give you a good start creating custom checks for your environment.